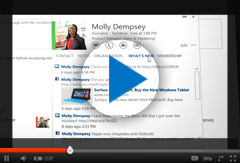 Purchase your Office 365 subscription. When the trial period is over, you can easily purchase the subscription of the plans you were trying out by clicking here, or choose and mix other plans. Contact us and we will help you with PO and choosing the right plans. You do not need to wait until the trial period is over, of course. You can purchase the selected plan at any time during the free trial. Select licenses for all people that will be using Office 365 account. You can combine Enterprise plans with Kiosk plans for “deskless” workers, who do not need the desktop applications. Assign licenses for every person and easily swap them if needed. If a person who had an account leaves a company, not a problem - the licenses can be reassigned to other people.